Selling tiles online can open a lot of opportunities for the sellers because of the fact that they can showcase and sell their products to a wider range of potential clients. 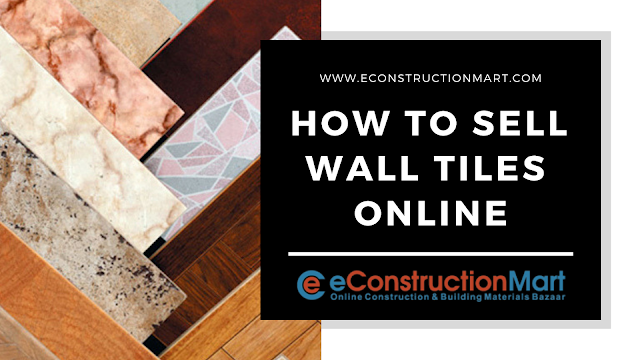 But it is a competitive world online and sellers need to display that they are best in offering the latest wall tiles and the best installing services. 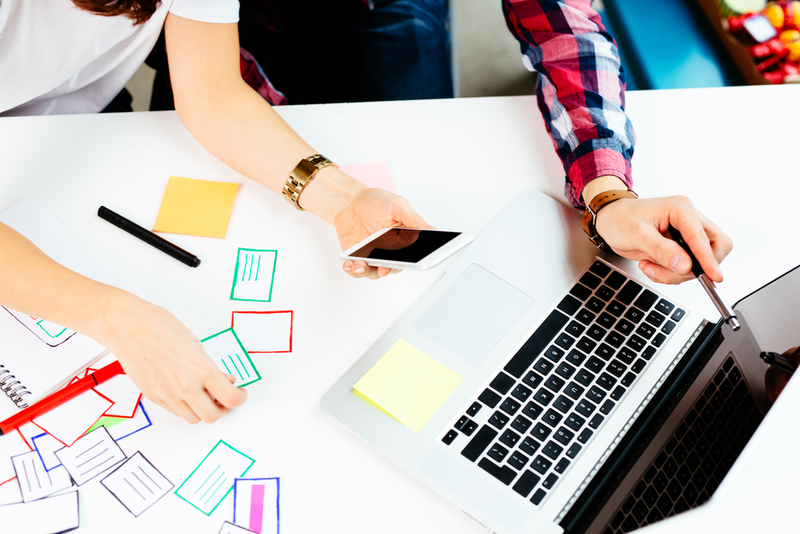 Follow the steps in this guide to step up your game in selling tiles online successfully. 1.) Help your customers visualize:- This is where you are required to do the idea generation about what will go on the internet. You need to create a portfolio of the work you have done so far to impress your clients when they see your listings online. You should have ample knowledge to share with your clients online and create a desire where they want to buy your product. 2.) Research with the designers:- Enquire about different tiles which appeal to their customers aesthetically. If they say they like bathroom tiles to be bright in color, ask for reference pictures and share it with your clients while offering them services. Mention about the designer collaboration which they can be offered if they are taking overall services from you. 3.) Form business opportunity with the existing builders:- Online you can also find a lot of builders who would be ready to give bulk orders for their new properties or even existing ones which would go up for sale and need minute changes. For example-the bathroom floor tiles have been stained after years of usage, you can take up that as opportunity as well. 4.) Create a picture gallery:- This is a very important step because when the person is scrolling through your pictures, it is going to give him more information about your brand and services and add to you being a genuine seller and not a fraud online. It’s a wonderful opportunity to display your before and after pictures to potential customers. For example, how you changed the entire look of the room by placing patterned wall tiles where the wall paint always faded away because of leakage in rainy season. 5.) Hire the best installers:-The work must be performed by the best to keep your credibility in the market and for more business opportunities. So, hire the best and publicize them on your online platform. These steps will surely assist you in successfully selling tiles online on eConstructionMart. When it comes to construction, which is very common nowadays owing to the commercial, residential and retail projects getting developed all around, the importance of tiles is simple undeniable here. It is not just building a house with brick and mortar but the architectural aesthetics too that play a vital role in beautifying the interiors of any house, office room or any other building. The normal floors and walls that are usually found in the conventional constructions can get an extraordinary touch with the help of an excellent tool known as tiles. The use of tiles has become quite common today. There are numerous varieties of designs, shapes, sizes and patterns, which find widespread use in almost every single real estate project. The various types of tiles include ceramic, vitrified, digital, bathroom, wall, floor, roofing, paving etc. One can easily pick up any one of these based on the choice of brand, price, size, coverage area, etc. However, it can be assured that tiles are way too affordable than any other counterparts used for the interiors of different rooms, floors and walls. In other words, a bathroom will have different necessities in terms of tiling as compared to the kitchen, drawing room or bedroom. Again, an office room will need specialized tiling when compared to a residential space or retail outlets. Accordingly, the requirement of tiles will vary but the correct kind of tiling can be attained after appropriate consultation with the architects and designers, who will definitely guide in the process of selection by incorporating their valuable inputs and expertise. The colors and texture of the tiles also differ based on the area of application. A professional can suggest you better ideas and you can even discuss your own concepts with them to come up with picturesque concepts. With eConstructionMart it has become very easy to have a look at the innumerable types of tiles. Branded companies such as Nitco, AGL, Somany, Varmora, City, Durato, Sunheart, Swastik, Ultra and many more other prominent names that have marked their prevalent presence in the domain of tiling are being showcased here for the customers to select only the best as per their need. 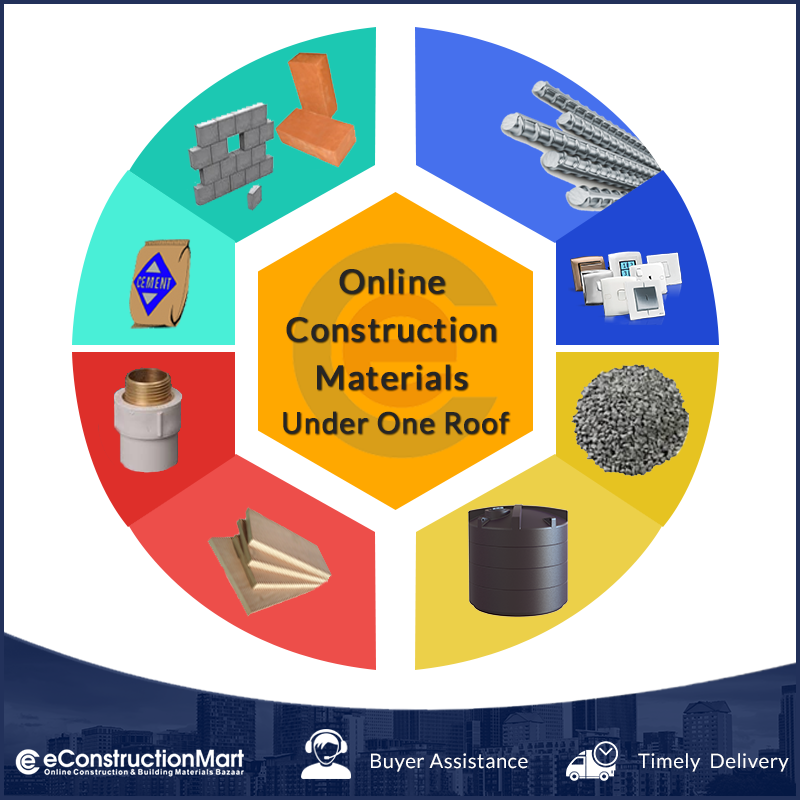 Get the best at eConstructionMart today! 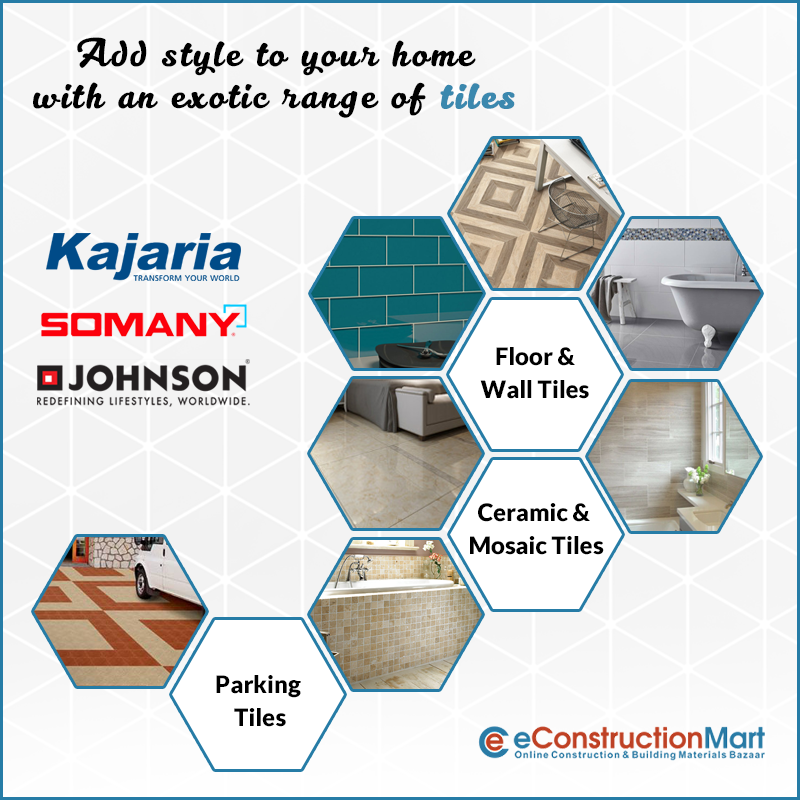 Get the tiles that make your room look trendy from number of options at eConstructionMart. Shopping at eConstructionMart is not only about saving time but also about money because under their 'Buyer Assistance' policy an in-house expert will not only work on your requirement but also will negotiate from your side with the sellers so that you get the best possible deal in the market.